EXPLOG is a modular and portable logging device that packs many embedded sensors. It can monitor and log various navigation, weather and kinematic parameters such as accurate GPS location, direction, speed, acceleration, orientation, temperature, pressure, altitude, humidity, air quality, noise level, light intensity, and proximity simultaneously. The saved data can be exported to a computer or phone via USB, WiFi or Bluetooth and also an on-board LoRa transceiver allows data sharing between devices and remote data acquisition. It can be used for research, fitness and sports performance analysis, and can function as a portable weather station and a surveillance device. The name is a wordplay on "exploration" and "logger". This project is under prototyping stage. I&apos;m using ESP32 as the main controller. All the sensors are in the form of breakout modules for now. Once I complete the prototyping, I plan to make a custom PCB and a 3D printed case. EXPLOG Standard - A handheld version with high capacity 18650 Li-Ion cells and TFT/monochrome LCD. EXPLOG Mini - Smaller version which is a self-powered, detachable module that can be attached to your robot or drone. EXPLOG Black Box - A compact module without a display but all the rest of the features. Orientation and acceleration sensing with Gyro and Accelerometer. WiFi and Bluetooth connectivity with ESP32. Remote data sharing and acquisition through LoRa transceiver module. External I2C and SPI interfaces. Scientific Research - this all-in-one embedded sensor package lets you collect climate information with accurate time and geographical location. Sports and Fitness- lets you collect sports performance data for real-time and post analysis. EXPLOG will be a persistent companion throughout your expedition, recording everything on your path without troubling you. Robotics - being modular and power redundant makes EXPLOG a suitable addition for remotely operated robots and drones. It is easier and convenient to use a standalone sensor module than to integrate everything onto the robot itself. Data from EXPLOG can be shared to the robot controller in real-time. Security and Surveillance - when you open the door to your room, a sudden pressure change happens. Together with noise level and proximity measurement, you can detect intrusions at homes or offices. EXPLOG can notify you in such events over internet connected through WiFi. Weather Forecasting - sudden variations in pressure and humidity could be an indication of an imminent storm. EXPLOG can monitor these and warn you, which makes it your personal weather station. Agriculture - lets you monitor and log climate conditions of your greenhouse or farm. EXPLOG can be programmed to notify you in case of any abnormalities. High resolution PNG file of ESP32 DevKit pinout diagram. 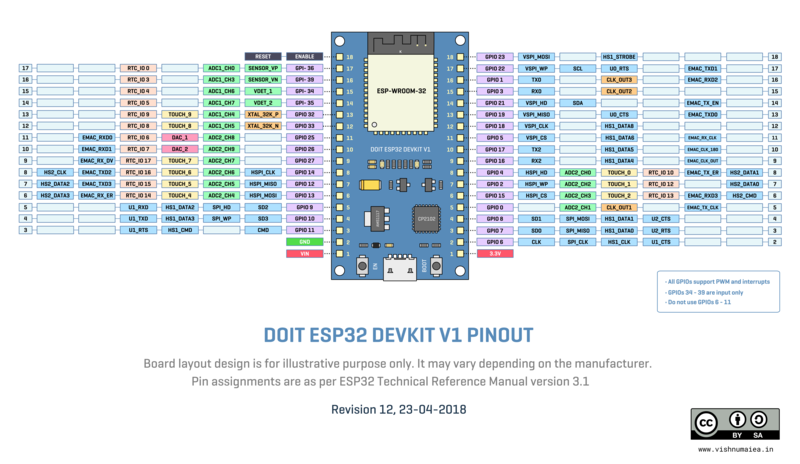 PDF file of ESP32 DevKit Pinout diagram. Shared under CC-BY-SA. PDF file of EXPLOG System Block Diagram. PDF file of Open Data Pool concept design. 1 × Mediatek MT3339 GPS Module Or any other similar ones. Exciting moment! EAZYFAB, an on-demand 3D printing service provider from Kozhikode, Kerala, India came forward to sponsor a single print for the EXPLOG project and they did. Thanks to Sijah AK and Nabeel BA from EAZYFAB. I sent them the STL files exported from Fusion 360. It was printed with PLA and the print is very sturdy. So far we&apos;ve been discussing about the system design, which sensors to use etc. I think now I&apos;m able to see the big picture. So here&apos;s the grand plan for the development of EXPLOG. First I need to buy all the sensors and modules from different stores and test them for their performance and possible constraints. Most of the sensors are available as breakout modules from many Chinese online stores. The rest can be bought from DigiKey or Mouser. If you own any sensors I have listed on one of the previous logs, and is willing to test them and share the results, that would really save me some time. Doing so will make you a contributor to this project and will be added to the team. Once we finish testing the sensors and the prototyping, we then will have to design a custom SMT PCB as per our form factors. Task 1 (core 0) - will repeatedly read values from all sensors on the I2C bus and update the global sensor readings variables. The keypad controller will be read when there there&apos;s an interrupt occurs at the event of user interaction. A dedicated input will be used for interrupt. Task 2 (core 0) - will update the display with information from the sensors depending on the current user interaction. Task 3 (core 0) - will save the data read from sensors to a CSV file on the micro SD card. Task 4 (core 0) - will read the NMEA data from the GPS module and update the variables. Task 5 (core 0) - will handle the LoRa protocol. Task 6 (core 1) - will handle WiFi and Bluetooth. I plan to design a utility software for EXPLOG that can fetch data from the device, visualize them in real-time and save it if required. I&apos;m considering Processing platform for this. A smartphone application can be used to connect to the EXPLOG via WiFi or Bluetooth and visualize data. Applications written in Processing can be exported to run on Android phones easily. Will have to see how far we can go with it. A cloud platform dedicated for sharing data from EXPLOG devices all around the world sounds a pretty bold idea. Users will be able to save the data from their device to the cloud by connecting to the internet and share the data to the Open Data Pool. Others can use these data for climate studies and a whole lot of other applications. Cool! The enclosure can be 3D printed on PLA material. The 3D models are designed in Fusion 360 and the source files will be made available to the public. If this project gains enough attention from the open source community and other interested enthusiasts, I would be able to sell EXPLOG as product at marketplaces such as Tindie for a reasonable price. ESP32 is a feature packed power house when it come to price-performance ratio which makes it ideal for all IoT applications. But there&apos;s one tiny drawback - limited number of GPIO pins. On the ESP-WROOM32 module, some pins are used by the flash chip and can&apos;t be used for other purposes. Some other set of pins can only be used as inputs, not outputs. As per the datasheet, ESP32 has 34 GPIOs of which I/O GPIO pads are 0-19, 21-23, 25-27, 32-39, while the output GPIOs are 0-19, 21-23, 25-27, 32-33. GPIO pads 34-39 are input-only. So in total we get 22 I/O pins and 4 input only pins. Even though it is not apparent in this initial phase of the project, sooner or later we&apos;re going to run out of pins if we&apos;re going to add more sensors and stuff in future. That&apos;s why I&apos;m considering adding a less powerful but GPIO rich coprocessor to the design. The second processor or microcontroller could offload some tasks from the ESP32 chip giving us more room for some possible number crunching tasks. For that I&apos;m considering the AVR Xmega series ATxmega128A3U which has 50 IO pins (64 pin package) which is plenty. It runs at 32MHz, has 128KB flash, 8KB SRAM, 7 UART, 10 SPI, 2 I2C and one USB modules. Let&apos;s estimate the pin requirements for each interfaces. So that&apos;s 19 of available 26 pins and we still have 7 pins left. If we ever use up all the pins left, we&apos;ll have to add a coprocessor. Size - must be small with less than 5 mm height, and be surface mountable and reflow solderable or through-hole solderable. Calibration - should be either factory calibrated or user calibratable. We need to make the right choices by considering the global availability and cost of each sensor to make sure that others will be able to get them to replicate/modify the device. These are what I&apos;ve been able to come up with. Datasheets of all these sensors will be available at the file section of this project. We need a sensor to accurately measure barometric air pressure becasue we need accurate pressure measurements for calculating the altitude accurately. DPS310 was my first choice becasue I had received an evaluation module from Infineon as part of a give away. But not everybody is going to get these as they are not available in the usual maker markets. BMP280 on the other hand is widely available and most are familiar with. But they&apos;re not the best ones out there. Let&apos;s have a comparison of features of sensors from leading manufacturers. From evaluating the specifications, BMP380 and BMP388 seem to be the best choices becasue they provide better absolute and relative accuracies, higher sampling rate, highest bit depth and higher absolute maximum pressure. The BME680 is special becasue it crams a pressure, temperature, humidity and air quality sensors in a single package. It might save some PCB real estate but can&apos;t compete with specs of other single purpose sensors, and it&apos;s going to cost higher than others. So we won&apos;t be using that. The DPS310 has its problems such as lower sampling rate, lower FIFO size etc, and it is priced similar to others. So these reasons also favor BMP380 and BMP388. Absolute accuracy is how close the output reading to the actual reading of absolute pressure (absolute pressure is the pressure reading taken with a zero pressure as reference). The more accurate the absolute pressure, more will be the accuracy of our calculated true altitude relative to seal level. So if we need more accurate altitude measurements we need more absolute accuracy. On the other hand, relative accuracy, as you guessed, is the degree of error between two relative pressure readings (absolute error on two relative readings will be same). This reading is crucial because it is what helps us to determine the relative elevation, for example how high a drone from the ground is etc. The cloud rendering is a life saving feature. Gets 4000px final renders within 20 minutes of queue time. I am interested in the mechanical and electrical construction of the keyboard. Any hints? It&apos;s just a 3D model for now and that&apos;s how I want the keypad/keyboard to be. For prototyping we&apos;ll be 3D printing the enclosure and 3D printing the buttons not going to work I suppose. We&apos;ll need to make just the buttons with silicon or some similar material with which I have no experience. But for proto we&apos;ll do a makeshift keypad. Do you have experience with making and integrating keypads ? I&apos;m sorry, but I couldn&apos;t understand what you meant by "hints". Everything is nice nice, except display. Nokia 5110 display have very bad connection to board. Yeah, I initially planned to use it becasue monochrome LCDs will offer better outdoor visibility under sunlight and also consumes only a little power. I plan to use 1.8" TFT LCD instead. I&apos;ll soon upload a current and better (revision 2) exploded view. great project bro, can&apos;t wait for it! Great Work Bro,All the best. You are about to report the project "EXPLOG : Exploration Logger", please tell us the reason.